Locusts could so completely destroy whatever food was growing, whether it be fruit trees or crops, that it would not grow again for some time. Yet the Israelites were assured that the years that it would take to recover from that spoiler, the locusts, would be restored, as if they had not occurred. That is like, if you will, a person who has lived carelessly with his money for a long long time, and then upon learning a better way to manage his finances, recovering quickly. In fact, he lives so abundantly that when he tells people, "I was once in debt, had nowhere to live, and job." The way he looks and lives would make it difficult to believe. Since he went in a different direction in his life, he reaped the rewards of a lifetime. In the same way, a homemaker can live in such a way as to fill in all those gaps she missed while working, so that others will cannot even imagine her ever being away. 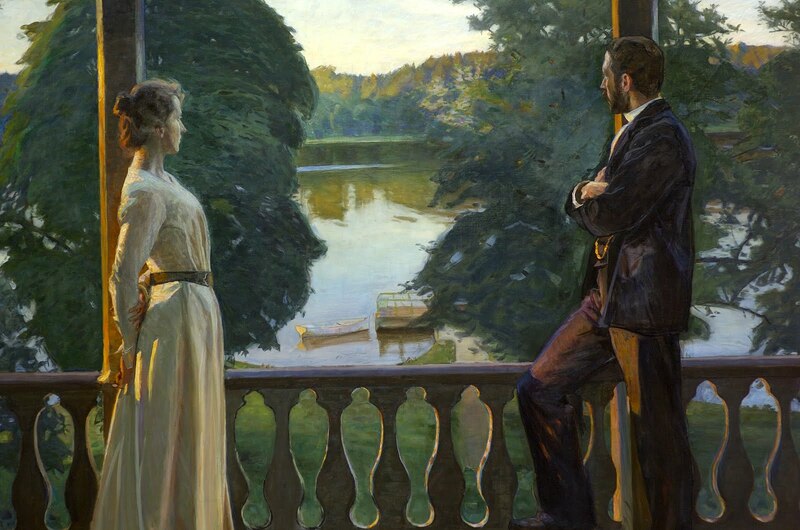 I met a wonderful woman once who had a lovely home, and although it was modest and she was not rich, she managed to have well behaved children and a good marriage. I asked her what her secret was and she said, "I came home after several years as a lawyer. My life just gets better and better. Before, I had a terrible marriage and couldn't manage my home." I was all astonishment. She was such a natural and her family was obviously so well loved and attended to that she must have been doing it for a lifetime. When you pack up your things and come home for good, do not worry about how you will catch up. You will find that your decision alone erases a lot of the grief and loss of those "wasted years that the swarming locusts have eaten." Most women find their paycheck is eaten up by the time they get it, anyway. That is certainly like the effect of the locusts on a land. A parable is told in Matthew** (a parable is an earthly story with a heavenly meaning) about a man who owned a vineyard. At various times throughout the day, he hired laborers. Those who were hired first agreed to the wage they would receive. In the evening, he paid off the workers. The ones who came first were given the same wage as the ones who came first. The parable of course refers to the fact that even if a person were to wait all his life to do what was right, he would still get the reward. Please don't get any ideas about being lazy and then wanting the reward at the last minute. This parable was talking about sincere people who were not hired at first because they did not know where the harvest was. In the same way, sincere women who realize they have missed out on a lot of years with their families at home, will find that they catch on quickly to full-time homemaking and seem to overcome those lost years. I used to think that children should learn to read by the age of 6 or they would be "behind." 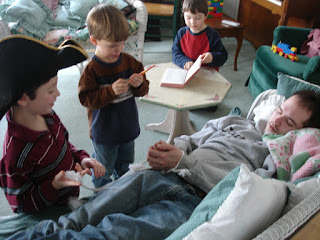 When my own children did not read until they were 9 or 10, I discovered that they enjoyed their new skill so much, they quickly caught up with, and surpassed the standard. When others heard them read fluently from the KJV Bible and classic literature, they assumed they had been reading since babyhood. A new homemaker who has not had marriage and homemaking bred into her during her youth, will find she quickly graduates from point to point until no one would believe that she just quit work a few months ago. Is there anyone who would say upon seeing an autumn rose that it was not as delightful as one that had bloomed early in the season? Years of getting to know your own children: really looking them in the eyes and learning their moods to discern where correction and encouragement is needed. Children shuffled from daycare to home in their childhood really miss out on the wonderful, quiet moments at home. 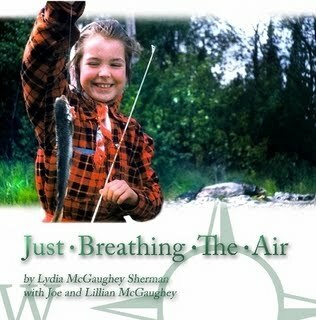 As I said in my book, "Just Breathing the Air," my mother often said that her childhood, though one in poverty, was "one, long, golden summer." It cannot be like that for children if the mother is not with them. -Years of learning to manage the home. Some women will work til they have a child and then come home, and find it all very overwhelming. If they would stay home from the very beginning, (see the story, "When Queens Ride By,") they would learn to manage just two people (the husband and wife) and when they became three, they would have a lot of tasks on automatic drive. The baby at home would only be a small adjustment. -All that time as a fulltime homemaker helped her develop patience and understanding. Changing diapers to her was not "a mindless job" as her young friends would claim, because she is helping someone who is helpless and developing a bonding with her child at the same time, a bond that, with proper care, will benefit her later on in life. -Really learning about things like nutrition and food value, and ways to be frugal. When a woman works for years and years and then comes home, it is harder to adjust. That does not mean that she cannot do it. It just means that she didn't have the time to really develop cooking and homemaking skills that she needed when she quit work. There will be a lot of trial and error to coming home full time. She won't be used to making her husband's salary stretch. She may not have picked up any frugal habits. She may not know how to be resourceful. She may not have taught her children all the reasons they should keep the lights off in rooms not being used. She may not understand how her life at home can make or break her family. This is a good reason to raise up daughters who have a good understanding of home life. When you come home at the last hour, you miss out on years and years of memories and blessings. That is not to say that a woman cannot come home later and have some reward. Of course she can, but let us not be careless. Let us pass on these values to the younger generation. Teach your daughters not to overlook their child-bearing years. Teach your children that the time to be home having a family and managing a home is in the beginning, not the end. We have all seen the heartache of those elderly women who, through the influence of feminist talk, believed they shouldn't be "just a homemaker" and went to work most of their lives. Later, they retired, and there was no family to come home to. Not feeling needed, they went back to work. We reap what we sow. If we can be dedicated to the family, even if you have only a husband and no children, or only children and no husband, you will get back that investment in later years. When home, you can learn as you go, just like a lot of people did. When I first began home schooling my children, I had no clue how to do it, but I knew it was the best thing for my family. I began to teach whatever was needed at the moment, from how to bathe and dress to how to formulate proper words (diction). When starting out, all you need to do is observe what is needed at the moment; what the most important thing is that needs to be done. Is it a meal, an ironed shirt, a made bed, the organization of paperwork? Once you begin to see how a day goes, you will fall into your own routine. Your husband may come home at 4 p.m. and you will find yourself busy preparing a meal in anticipation of that. Maybe he leaves for an appointment at 9 a.m. In preparation you will need to see that he has clean clothes available. Eventually, instead of doing things at the very last minute, you'll find it necessary to prepare hours and even days ahead. That gives you more free time to do creative things, write to your mother, show hospitality to someone, or do essential shopping. One of the best examples I ever watched was a woman from Britain whose mother was an excellent homemaker. 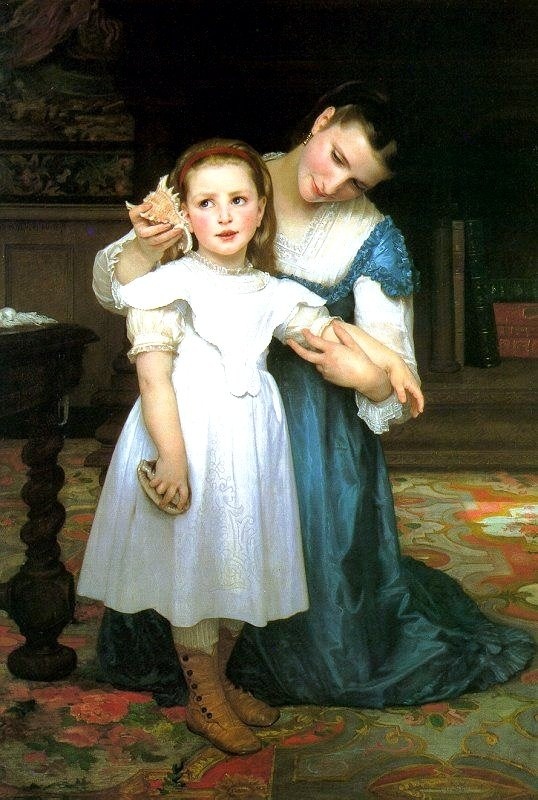 This daughter had developed habits without knowing it, just from the home life she had, observing her mother. When I stayed in her home I noticed that she had plenty of leisure time. She rarely had huge jobs to do or had to "climb out" of a pile of work. She managed this by never making a wasted motion in her house. Once, she and I were going to watch a movie in her sitting room. As I was being seated in a comfortable chair, I noticed that on her way to her own chair, she straightened up a stack of books, removed some old papers, and put away a sweater that someone had left. Later in her kitchen, she did the same thing as we were merely walking through. If she were to go to one end of the house, she would surely take something on the way, or find something to put away somewhere else. She never saved up work for a cleaning day, but she was not always cleaning! In my own home, I've had to learn the skill of not creating more work for myself. Instead of getting out an entire set of pots and pans I sometimes cook in one pan, beginning with the hardest to cook item, and ending with the food needing only minimal cooking. Instead of using an entire set of measuring cups and spoons, I measure out the dry ingredients in one big cup and then the liquid ingredients. One cup to wash is better than 4. Mixing and patting baked goods in one pan is also a time saver. It is not necessary to always do this, but it is good to know when you are creating more work for yourself than necessary. The homemaker also needs to enlist the help of the other members of the family, as she is not there to do everything, but to guard and guide the home and to see that it gets done. Even if she cannot manage it altogether, and is not a particularly good cook or a brilliant teacher, just her very presence, and her attempt to be on her throne as manager of the home, will make a big, big difference in her own life and the lives of those around her. I do not know how you've survived. But they don't know about your junk. Sticking in the muddy muck. Or the Little Debbie cinnamon buns. Sleeping with your hunting knife! When you try to find your shoe. When you clutter up the house. 'Cause taking care of you will make her break! Your wife will like us better than she likes you. When your place has got her best. She'll enjoy our tea time tarts. The guns and poles in your place. Will send her here just to restore. And be sure she has a car. She can come and be civilized. Love Mom, famous author and poet. For more "Stevie-Stuff" check out these two posts over at The Pleasant Times. I have been on a fun, frugality kick at my house. Today I have a unique gift bag tutorial. While it is true that you can find gift bags for only a dollar, and some times even two or three for a dollar at the dollar store, we are teaching our children to be resourceful for those times in their lives when they may not have money or may not have access to a store. It is good for children to learn the quality of resourcefulness. If you do not have enough empty food boxes, all you need is a sheet of poster paper, which will cost about 50 cents, and will make anywhere from 4 to 12 boxes. Just trace around a box you like onto the poster paper. Here, we are using an empty cereal box. The ingredients for this are: scrapbook papers you already have, glitter glue, white glue, scissors, pen, brush and pan for glue. You will also need the blank side of a piece of junk mail for a pattern. Cut off the top flaps of the box. Trace one side of the box onto the scrap of paper. Cut out the traced square from the scrap paper. Then, fold it in half and with some kind of straight edge or ruler, draw an opening for a handle. This is what it looks like when you unfold it. Temporarily anchor it down onto the front of the cereal box with tape and trace inside the handle space you made. You can see the outline of the handle here. Cut in from the top of the box to the hole and cut it out. Tape the cut back together. Don't forget to do the same on the other side of the box. Take two pieces of square scrapbook paper. Trace the handle on them, using the piece of scrap paper pattern. Leave a little at the top to fold under. Turn the paper over and brush glue liberally on the under side of it. Press the paper on to the box, matching up the handle area. Press down the sides. Do the same on the other side. You will need to place this project on a brown paper bag to protect your surface. Don't worry if it wrinkles up. Be sure to trace and cut a piece for the end of the box. Sign it if you like. You can outline the rough edges of the handle area to give it a nice finish by using Polymer, Scribbles, or Dimensions tee-shirt paint. Allow to dry the required amount of time. Glitter glue with a tip will also work. It seems to glue better and does not wrinkle as much as scrapbook paper. Cover the front and sides of the box with one picture, and use a different kind of paper on the back. Then, cut spaces in the sides to thread a wide wired ribbon for a handle. Just cut along the seam and into the side. Then tape it back up again for a finished look. This is what the box looks like when finished. Tie bows on each side if you like. I am really enjoying using up bits and pieces that I have, and freeing up space. These bags are tall enough to hold a coloring book and crayons for a child, or a special magazine and gifts for a friend. The boxes will not last long, but they will be thrown away anyway. If you do not have a wired ribbon you can use anything that will substitute. Just look around and you may find something in your home that will be creative and unique. Here are a few things I did for Valentines day. You can click on each one for a larger view. 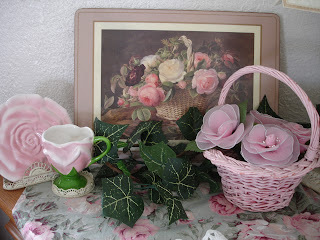 This is a corner table with a wood placemat, teleflora tea cup, vine, and basket of nylon flowers. The rest of my house is not in the best shape, but this corner makes me smile and give me energy. My muslin living room curtain for a 105" wide window was made with 120" muslin. 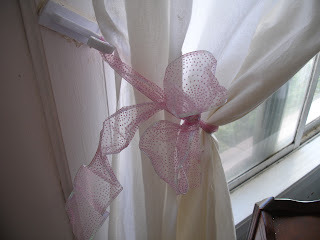 Here it is tied with a wired pink dotted ribbon from the dollar store. Just substitute the colors of your choice to make things like this in your own style. 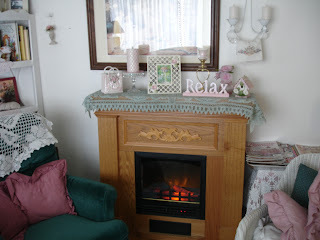 The fireplace mantel decorated with a few treasures. Grandmother's chair is on the left. It is here my husband sits. We cover the head area with one of her pieces of lace. She used it to keep the chair clean. 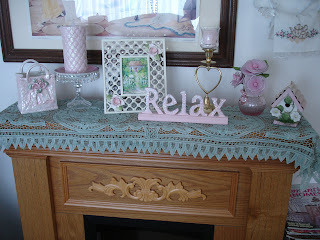 Close up of the mantel area. 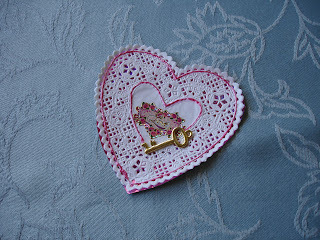 I tried my hand at the old fashioned paper doily heart, backed with a piece of shiny paper cut from a mylar bag from the dollar store. The dollar store also has very large bags, so there is no need to spend a lot of money.The key comes from earings from the dollar store. Each earing had two keys on it. 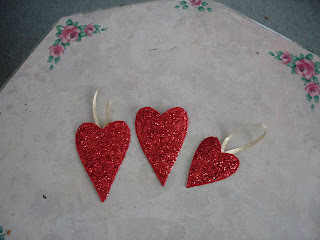 These were some hearts I made for a heart garland. They are made of poster paper, iron-on paper, fabric, folkart glitter paint in clear, and dimensions or scribbles polymer tee shirt paint for the edges. I made up the pattern and will be happy to provide it at a later time. I'm getting ready to update links. Please put yours here if you want to be on the side bar. 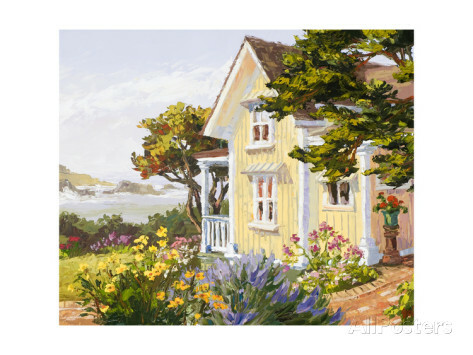 One of the most challenging things today, is acquiring personal contentment in the home. 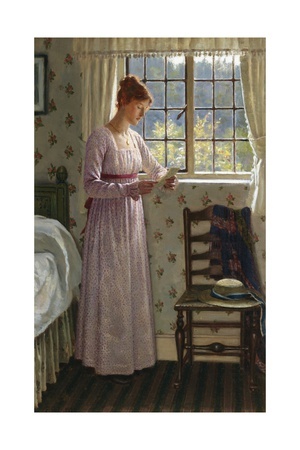 It might be enjoyable to have a look into the past to see why so many women enjoyed the home. 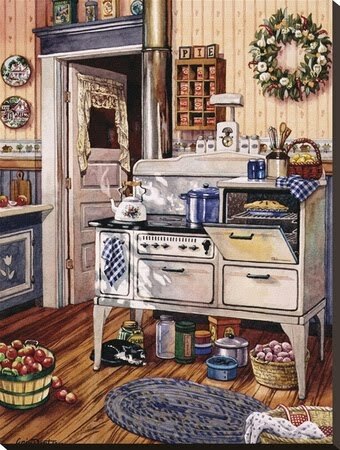 What was it about the home that made every woman look forward to being a homemaker? 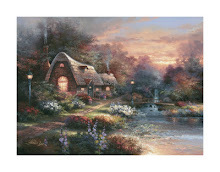 Why were there so many precious memories of the home? In the 19th century, most homes did not look like they do today, yet a woman was most proud to be the lady of the house. Many in that generation did not grow up with any wealth, and some had very few modern conveniences. Our mothers, grandmothers and great-grandmothers had no fabulous mansions, or wealth to speak of, yet they were always able to make a hot meal for someone and provide a safe and happy place for their own families. Almost all of them wanted to make the family successful, and very, very few of them would have rather left their children in someone else's care or left their homes while they pursued other things. They believed that the way the home was cared for and the way the family's needs of food, shelter and clothing, social and spiritual duties, education, etc. were so important that it required the full attention of the lady of the house. It may seem strange that our fore-mothers hired help to sweep and wash, but I still remember stories from people who lived at a time when that was considered quite a good opportunity to earn some money. 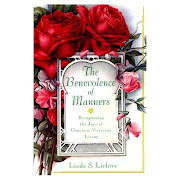 Long after the era in which you could hire help in the home, I remember being able to pay young girls to come and help keep house.Until very recently, it was possible to hire young girls who wanted to learn about homemaking. They were glad to have a summer job, and enjoyed helping to keep house. 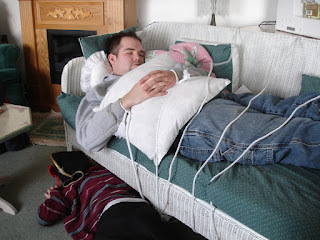 I, myself, as a teen ager, used to help mothers who had just come home with a baby. It was considered quite normal at the time and there was ne'er a discouraging word spoken about it. No one was forced to work, but the jobs to help in homes were always available. Working in someone's home gave a young woman a chance to see how the home was managed and to develop some experience in home making. 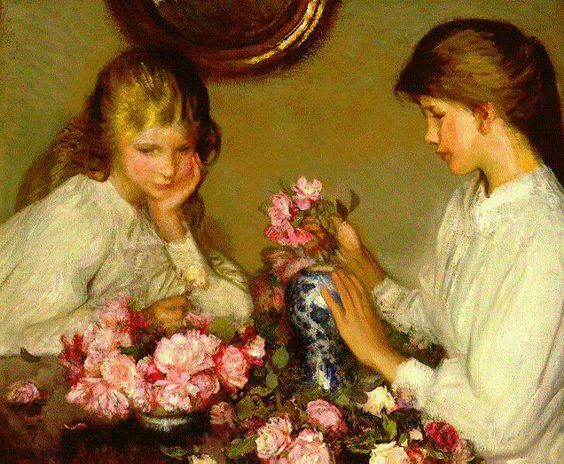 I believe, in general, many young girls seemed happy and content with the idea of just being young and being given the responsibility to work in someone's home. They wanted to be good examples to young children and be worthy of being hired. Dressing was important in those days, even when you were going to work cleaning someone's house. The girls did not want to wear jeans and flip-flops and tank tops. Tattoos, piercings, and metal in the skin was considered something too primitive. Girls especially wanted clear skin, shiny hair and good breath. They were concerned about their grooming. 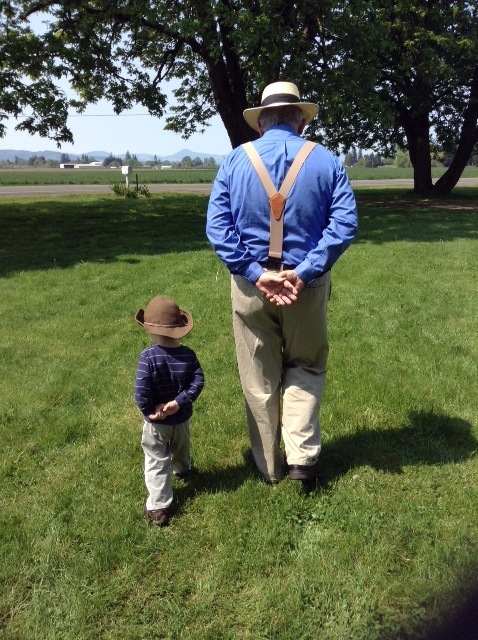 Clothing was clean, starched, buttoned up, tucked in, and in general, made a person want to stand up straight. Even the poorest person would not have worn anything torn, dirty, with vulgar slogans, or too small for them. They thought these things were only for grunge work or for camping at the lake. Ironing was a type of activity that calmed the heart beat and made one think. The iron board was brought out and some times positioned in front of a window. Some times a sister or friend would bring her ironing board, and help with the load of ironing. Remember, in those days, everything needed to be ironed. Everything was wrinkled. There was no permanent press as there is today. One simply would not wear a wrinkled blouse. Even the jeans were ironed. There was a certain kind of contentment that came from caring for one's clothes. The laundry was carefully washed, hung on the line, and then when dry, sprinkled with linen water (just a combination of water and lavender or some other scent) and rolled up to be ironed later. Seeing the clothes, even if there were just a few, hanging neatly on hangers in the small closet, brought a great deal of satisfaction. 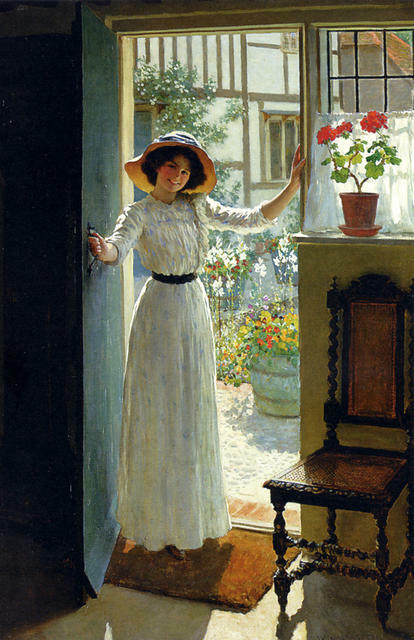 A porch or place to sit outside was common amongst most families, whether rich or poor. Whether it was a patio set, picnic bench or just sitting under a tree, it was considered a very essential part balanced living, to go outside and spend time in nature. One thing that was common for most families was a swing. Whether it was hung from a porch or a tree, it was an accessible form of relaxation. It cost very little to hang a rope from a strong tree limb and make a board to sit on. Here, one could go outside and and let the mind rest. The eyes could take in the beauty of the path and the flowers growing along side of it. The ears could hear the leaves in the trees moving in the wind. 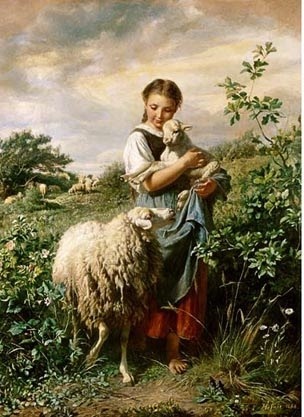 A person did not have to be rich in order to find contentment in such simplicity. Walks were a common occurance. It was considered healthy to take a walk once a day. Walks were not just mechanical actions designed to get exercise. 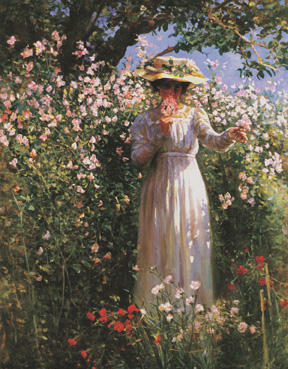 While engaged in a walk, a woman might pick a few flowers or observe something lovely along side of the road. She might walk with a sister or her mother and talk of many things. A walk provided an important time of thinking. When one was restless or experiencing uncertaintly of mind, a long walk was considered a most important treatment. Nature walks sometimes involved collecting natural materials like pine cones and orchids to make an indoor display in a bowl. In cold seasons, walking was important enough that people bundled up adequately in outdoor clothing. There would be no dashing to the mail box with no coat or sweater. One dressed up in warm boots, coat, scarf, hat and gloves, and made the most of it. how important the precepts of the Bible were to them: loving others and giving what you could. Valentines Day here in America has become a day for everyone. Ladies especially enjoy it and exchange hand made hearts with friends and loved ones. If you want to be happy, begin where you are. Don't wait for some rapture that's future and far. And soon you'll forget that you ever were sad. Till its steady flame brightens each heart that comes near. You'll find what you look for--don't look for distress. That the sun is still shining, but you're in the way. No man sees his shadow - who faces the sun. Here is an idea for getting thank-you notes out in a timely manner. I discovered this when I found myself always being late with thank you notes. I was so late in one case, that the lady invited me out again before I was able to get a note of appreciation to her for the last visit. I always have such a huge amount of things to do that eventually something gets missed. Having a supply of cards on the desk makes it much easier to remember to write a thank-you note. When anyone invites me over, I get out a card or letter paper from its place immediately and address the envelope, adding a stamp. I do this before I have even gone to visit her, even if it is a week or two away. That way, I will not forget or get too busy. The card or letter will say how grateful I am that she took the time to invite me and how much I enjoy her friendship, and sign my name. Then I leave the card by the front door in a letter box until after I have gone to her house. When I return from her house, I add a p.s. and write a few sentences about the visit, and mention something about her house or the food or the visit. I will be removing links and updating the blog soon, so if there is anything you want, be sure to get them. The articles will remain. Some links are no longer in existence and some do not wish to be here, so I am taking them all off and starting over. My own links to articles here will remain, as well as the theme articles and books. I'm just updating the shopping and the homemakers links. and what kind of example you had to follow while growing up. Since a few people sent comments not related to the exact poll, I will save them and use them in another post. I know that everyone has a reason for what they do, but I was only asking why so many women were coming back home full time or planning to be full time wives and mothers and homemakers. There were several unrelated comments that have issues that can be addressed at another time. Also, I usually try not to publish anything that would degrade or discourage or be a put-down of stay at home wives and mothers. Thank you for respecting that and for respecting their convictions. One lady wrote to ask me to address the problem of how to answer those who challenged her decision to be at home. Perhaps there will be a post on this later so that people can offer their best help on that subject. Others want to know what to do to reclaim the time that they have lost by being out in the working world for so long; how to re-discover and re-establish their home life and their homemaking abilities. This also, though somewhat related the the "poll" is still too different to include, but a later post may surface sometime with that discussion. 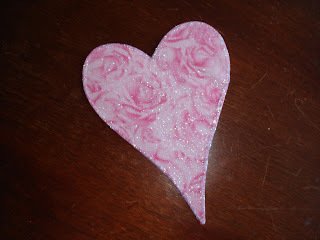 I am working on a video to post about glitter crafts. I want to start a trust fund or a foundation called The foundations for World-Wide Glitteracy." I believe everything should be glitterized. I titled one of the stories in my book "A Thousand Sparkling Diamonds," because when I was growing up near that beautiful blue lake in Alaska in the 1950's, the water sparkled in the summer sun like jewels. If you look carefully you can see glitter on many different things, from the grass to the trees. Thanks so much to everyone for the gracious responses to the previous post. Someone wrote to me: "When I was younger I too thought the world was coming to an end. Everything seemed so confusing. It was only when I settled down to the serious business of marriage, home and family, that life began to make real sense. I think I cried myself sick a couple of times over the craziness around me. Now I see it was just the world trying to make life work differently than it is supposed to , and trying to make us young people believe it. Life makes much more sense now, especially when I see the Biblical plan for mankind."